Everyone knows that strong, healthy, shiny hair helps you look your best. That’s why it’s so important to take care of your locks, especially if your hair is chemically-treated and exposed to heat damage. Since we put our hair through a lot on a daily basis, using a quality shampoo with keratin will restore lost protein in the hair shaft and revive the health and beauty of your hair. In this review, we answer urgent questions about keratin-based products and list the most popular shampoos along with all their advantages and disadvantages. Not all keratin shampoos are made equal. Every brand has a unique formula and it’s very important to find the one that suits your hair type. You may want to test different keratin products before you find your perfect match. We’ve analyzed 10 of the most highly-praised and best-selling shampoos formulated with keratin. 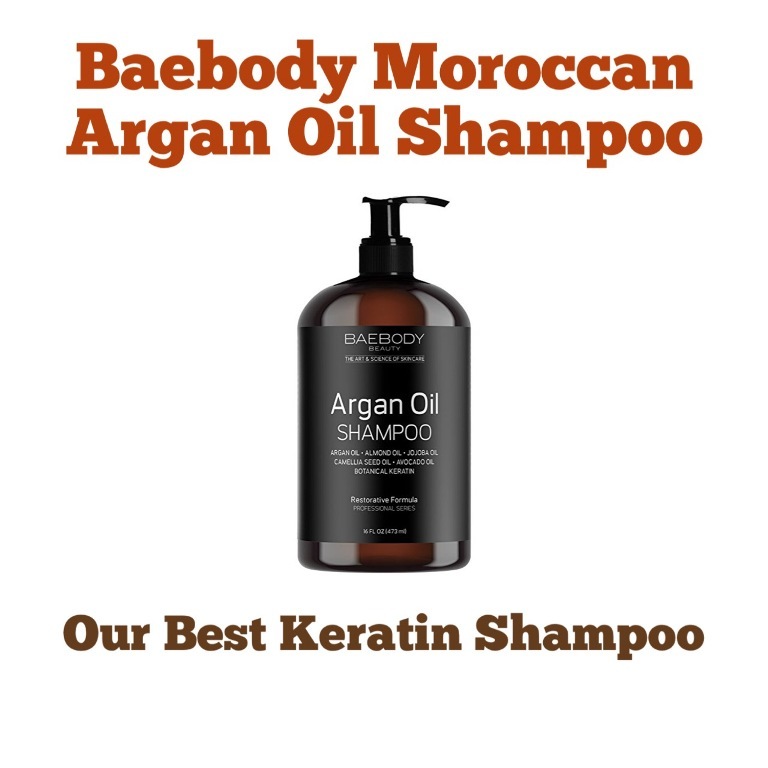 One of Amazon’s best sellers, the sulfate-free Baebody Moroccan Argan Oil Shampoo is loved by many for its hydrating, soothing, and repairing properties. It’s suitable for a wide range of hair types, and provides added moisture, softness, elasticity, and shine. Packed with organic ingredients and natural oils, the restorative formula was developed to gently cleanse and repair processed, naturally dry, and thinning hair. Extreme dryness usually comes with a flaky scalp and drab hair. This Argan Oil product is one of the best shampoos for dry itchy scalps: it soothes irritations and hydrates hair from root to tip, leaving you with manageable, silky hair with no residue. Forget about frizz and tangles, we definitely recommend this quality shampoo for dry hair in need of emergency help. Many reviewers say that you can feel the difference after the first application. You’re on your way to healthy-looking, silky, and smooth hair with Baebody Moroccan Argan Oil Shampoo. When hair lacks keratin protein, one of the building blocks of hair, it looks and feels dry and lifeless. The Suave Smoothing Shampoo with Keralock Technology improves hair health by restoring lost keratin in the hair shaft. This affordable shampoo leaves processed hair healthy-looking, soft, and touchable after the first application. The Suave Keratin Infusion Smoothing Shampoo is recommended for lifeless, chemically-treated, and heat-damaged hair. It eliminates frizz and helps with hard-to-manage hair, whether it’s curly or very thick. Best results are achieved when used with the matching conditioner. Tip: Use the Suave Professionals Dry Shampoo Keratin Infusion to maintain freshness and add volume to your hair between washes. Chemicals in dyes and salon hair-smoothing treatments can weaken the hair shaft, cause breakage, and create lifeless-looking locks. All the more reason to use hair care products that renew hair. The Matrix Biolage Keratin Dose Shampoo gently cleanses and nourishes color-treated hair to revive its healthy shine. Free from sulfates and enriched with Pro-Keratin and silk, the shampoo gently removes sebum and product buildup and moisturizes hair to make it smooth, silky, shiny, and frizz-free. Not only does it look better, it feels stronger, thicker, and healthier. Matrix Biolage Keratin Dose Shampoo is strongly recommended for overprocessed hair. It brings back the beauty and healthy shine that slowly fades with every chemical treatment. The product is also good if you want to extend the effects of a salon Keratin treatment. If you want longer, stronger hair, the Anti-Breakage Shampoo from Organix is here to help. The fortifying formula is infused with Argan oil to strengthen and nourish hair. The shampoo is gentle on hair and scalp, and can be used every day. Longer hair is harder to care for and needs more TLC than shorter locks. The main issues with long hair maintenance are breakage, frizz, and tangles. After using this shampoo, hair is easy to comb through with no tangles. OGX Anti-Breakage Shampoo is an inexpensive strengthening shampoo that also helps grow hair longer by keeping it soft, silky, and healthy. It won’t strip color-treated hair, but don’t use it if you’ve had a salon keratin treatment. The Keratin Complex Shampoo is designed to thoroughly cleanse strands without stripping them of keratin and moisture. If you look at the reviews, you will find that this product is the most recommended by salons after you’ve received a salon keratin treatment. It adds shine and volume to your hair while leaving your locks soft and smelling great. What customers love the most about this shampoo is that it acts like a 2 in 1 liquid shampoo. It gently cleanses as well as conditions hair. It’s also great for dry, color-treated hair. Enjoy your color longer and quench your dry hair with one bottle! If you are a fan of the Keratin Complex Shampoo, you’ve probably noticed that the manufacturer has changed the packaging and the formula, but not to worry, you can expect the same level of high-quality from the product. The shampoo delivers what it promises. We certainly recommend it for colored hair, keratin-treated hair, and as a keratin shampoo for men, since it has a pleasant unisex scent. This It’s a 10 product is a sulfate-free keratin shampoo that helps prevent frizz due to humidity and is great for colored hair. It repairs damaged strands, protects hair from heat and sun damage, and leaves it bouncy and soft. The product also prevents breakage and restores elasticity. Fans of the It’s a 10 Haircare Miracle claim that they could see a huge difference in their damaged hair three days after using the shampoo and that it is worth every penny! Customers are often cautious with products that promise too much, but this one seems to meet every possible expectation you can have from a shampoo. No side-effects, no complaints, just the benefits of healthy hair. You can use it to preserve your color, prolong your keratin treatment, and boost the health of your hair. With most products, the results may vary from individual to individual, but this Miracle Shampoo Plus Keratin is unanimously effective according to Amazon users. It is a rare privilege to recommend such a highly-praised product. This bio-keratin shampoo is formulated with Brazilian cocoa nut oil mixed with keratin proteins that specialize in smoothing and strengthening curly or wavy hair. It also contains organic avocado oil and cocoa butter to smooth the cuticle for strong, straight strands, giving them shine. To top it off, the product is inexpensive, safe for color-treated hair, and is not tested on animals. Being beneficial for both dry and oily hair, the Ever Straight Brazilian Keratin Therapy Shampoo has won many fans with unruly and demanding hair around the world. While this organic Brazilian Keratin Terapy Shampoo can’t perfectly straighten your hair, it can help give you straighter, softer, and smoother hair with no frizz. If your hair is prone to tangles, use the matching conditioner. As with other Organix shampoos, this one contains a sulfate-related Sodium C14-16 Olefin Sulfonate. Some consider it safe for keratin-treated hair, but we wouldn’t recommend using it if you want your salon treatment to last longer. The CHI Keratin Shampoo incorporates keratin proteins, jojoba and argan oils, as well as their exclusive Keratix technology, soaking the hair in preventative hydration, giving it extreme moisture, softness, and shine. This shampoo is perfect for weak, chemically-treated, heat and sun-damaged hair, transforming it into healthy, strong hair with natural volume and shine. The product definitely has its pluses and shows excellent results in many, although there are cases when it simply doesn’t suit some manes. Here are some pros and cons to consider. The CHI Keratin Shampoo may leave some buildup and cause greasy-feeling hair and itchy scalp. In some people, it may make hair hard, dry, and leave it tangled. A protein shampoo rebuilds the structure of your hair, so you get results depending on how much keratin you already have. And you can have too much of a good thing. If your hair feels dry and hard after using this shampoo, try to follow it with a moisturizing conditioner, not a keratin conditioner. The product is not recommended for keratin-treated hair since it contains a sulfate-related ingredient. This ultra-rich and creamy keratin oil shampoo heals your hair and builds healthy, shiny, luscious strands every time you use it. The product enhances body and strengthens your hair with its concentrated healing properties. The keratin protein reconstructs the inner layers of your hair while adding bounce and shine. The shampoo also contains Phytol IV, which is a component that re-hydrates hair and replenishes your strands with moisture. With this L’ANZA shampoo, you get everything your hair needs to look its best, including strength, volume, and hydration. Despite the added oil, it doesn’t weigh your hair down. It also helps your hair dry faster without frizz or static. Any hair type can benefit from the L’ANZA Keratin Healing Oil Silken Shampoo, but it’s particularly recommended for colored and keratin-treated hair. It’s a bit pricey yet absolutely worth it, taking into account the high quality of this chemical-free product. The AG Sulfate-Free Strengthening Shampoo nourishes and restores life to dry, damaged hair. The keratin amino acids provide amazing, long-lasting results, such as improved elasticity and noticeable softness. The shampoo is said to be quite thick, so it lasts longer and takes less product and more water to lather. Fans of the product claim that it has a great scent and produces results after just one use. Soft, silky, clean, and great-smelling hair can make your day. This product can give you touchable, soft, healthy hair and is suitable for everyday use. AG Haircare Refuel may not be as hyped as shampoos of other brands, but it can really give you stronger, thicker and healthier-looking hair. It’s recommended for damaged and keratin-treated hair to keep results as long as possible. It’s on sale as a keratin shampoo and conditioner set but you can use the shampoo with other conditioners you love. A keratin shampoo sounds like the best treatment for weakened hair, but are there any pitfalls associated with using it? We’ve answered the most frequently asked questions related to the product below. What Is Keratin Shampoo? Is Keratin Shampoo Good for Your Hair? It’s a shampoo infused with keratin, one of the building blocks for hair. A keratin shampoo is developed to rebuild or fortify the protein structure of damaged hair. If you hair is weak, dry, drab, lifeless, overprocessed, this product will make it stronger, give it shine, silkiness, softness, and natural volume. They are safe, to use, however, not every keratin shampoo is free from sulfates and salts. If you have a salon keratin treatment, read the label carefully before buying. Not every product is safe to use on salon keratin treatments. Also, be sure not to leave keratin products in your hair any longer than the recommended time, because they may do the opposite to what you expect — weaken and dry your hair, making it brittle. It works, but it’s no substitute for a salon keratin treatment. A shampoo with keratin can make your hair smoother, softer, stronger, helps to detangle it, and prevents frizz. What Does Keratin Shampoo Do for Hair? It rebuilds damaged the protein structures in your hair, improving its health and appearance. If the keratin shampoo you’re using suits your hair type, your hair will get shinier, softer, stronger, and easier to comb through. Does Keratin Shampoo Straighten Hair? Since your hair is getting smoother with a keratin shampoo, the product also provides a slight straightening effect, but it’s not the same as after a keratin treatment, although with continued use your hair will get stronger and sleeker. Can Keratin Shampoos Be Used for Hair Growth? It can help you grow hair. Since your hair gets stronger with added keratin, it breaks and sheds less which results in visually thicker, longer hair. Keratin shampoos are often formulated not only to strengthen, but also nourish hair and scalp with natural oils and natural extracts. 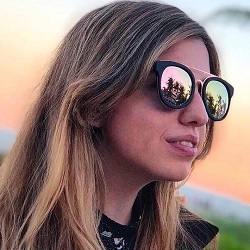 These are known to promote hair growth. Hopefully we have eased you into the subject of keratin shampoos. These were our top 10 keratin shampoos for stronger, shinier, smoother hair. Good luck finding the perfect product to boost the natural beauty of your hair!